To help organize your BigQuery resources, you can add labels to your datasets, tables, and views. Labels are key-value pairs that you can attach to a resource. When you create BigQuery resources, labels are optional. After labeling your resources, you can search for them based on label values. For example, you can use labels to group datasets by purpose, environment, department, and so on. 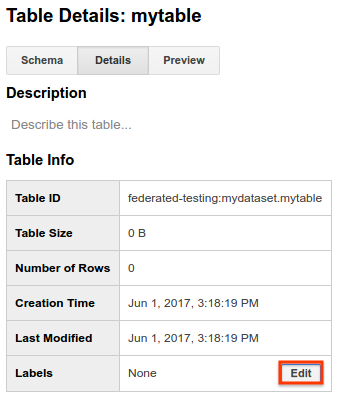 This page explains how to manage labels on BigQuery resources, including how to update and remove labels. For information on adding labels to BigQuery resources and on using labels in BigQuery, see Adding and using labels. A label is a key-value pair that helps you organize your Google Cloud Platform BigQuery resources. You can attach a label to each resource, then filter the resources based on their labels. Information about labels is forwarded to the billing system, so you can break down your billing charges by label. Team or cost center labels: Add labels based on team or cost center to distinguish BigQuery resources owned by different teams (for example, team:research and team:analytics). You can use this type of label for cost accounting or budgeting. In the web UI, select the dataset. On the dataset details page, click the pencil icon to the right of Labels. To apply additional labels, click Add label. Each key can be used only once per dataset, but you can use the same key in different datasets in the same project. Modify the existing keys or values to update a label. On the Dataset Details page, to the right of Labels, click Edit. To add additional labels or to update a dataset label, issue the bq update command with the set_label flag. Repeat the flag to add or update multiple labels. If the dataset is in a project other than your default project, add the project ID to the dataset in the following format: [PROJECT_ID]:[DATASET]. [KEY:VALUE] corresponds to a key:value pair for a label that you want to add or update. If you specify the same key as an existing label, the value for the existing label is updated. The key must be unique. [DATASET] is the dataset you're updating. To update the department label on mydataset, enter the bq update command and specify department as the label key. For example, to update the department:shipping label to department:logistics, enter the following command. mydataset is in myotherproject, not your default project. To add additional labels or to update a label for an existing dataset, call the datasets.patch method and add to or update the labels property for the dataset resource. Because the datasets.update method replaces the entire dataset resource, the datasets.patch method is preferred. This sample uses the Google HTTP Client Library for Java to send a request to the BigQuery API. * Add or modify a label on a dataset. // Authenticate requests using Google Application Default credentials. // Get a new access token. // new one if it is not yet expired. // Set the content of the request. // Send the request to the BigQuery API. // Workaround for transports which do not support PATCH requests. Because views are treated like table resources, you use the tables.patch method to modify both views and tables. In addition, because the bigquery.user role has bigquery.datasets.create permissions, a user assigned to the bigquery.user role can update tables and views in any dataset that user creates. When a user assigned to the bigquery.user role creates a dataset, that user is given OWNER access to the dataset. OWNER access to a dataset gives the user full control over it and the tables and views in it. In the web UI, select the table or view. Click over to the Details tab, then click the pencil icon to the right of Labels. On the details page, to the right of Labels, click Edit. This example shows the details for a table. To add additional labels, click Add Label. Each key can be used only once per table or view, but you can use the same key in tables or views in different datasets. To add additional labels or to update a table or view label, issue the bq update command with the set_label flag. Repeat the flag to add or update multiple labels. If the table or view is in a project other than your default project, add the project ID to the dataset in the following format: [PROJECT_ID]:[DATASET]. [DATASET] is the dataset that contains the table or view you're updating. [TABLE_OR_VIEW] is the name of the table or view you're updating. To update the department label for mytable, enter the bq update command and specify department as the label key. For example, to update the department:shipping label to department:logistics for mytable, enter the following command. mytable is in myotherproject, not your default project. To add additonal labels or to update a label for an existing table or view, call the tables.patch method and add to or update the labels property for the table resource. Because the tables.update method replaces the entire dataset resource, the tables.patch method is preferred. * Add or modify a label on a table. Currently, updating a job label is not supported. To update the label on a job, resubmit the job with a new label specified. 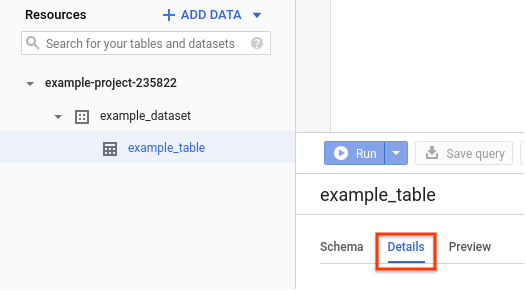 A label can be removed from a dataset, table, or view by using the GCP Console, the BigQuery web UI, the command-line tool's bq update command, or by calling the datasets.patch or tables.patch API method. Calling the datasets.patch API method. Click the delete icon (X) for each label you want to remove. To remove a dataset label, issue the bq update command with the clear_label flag. Repeat the flag to remove multiple labels. [KEY] is the key for a label that you want to remove. To remove the department:shipping label from mydataset, enter the bq update command with the --clear_label flag. mydataset is in your default project. To remove the department:shipping label from mydataset in myotherproject, enter the bq update command with the --clear_label flag. To remove a particular label for an existing dataset, call the datasets.patch method and update the labels property for the dataset resource by setting the label's key value to null. To remove all labels from a dataset, call the datasets.patch method and remove the labels property. Calling the tables.patch API method. In addition, because the bigquery.user role has bigquery.datasets.create permissions, a user assigned to the bigquery.user role can update a table or view in any dataset that user creates. When a user assigned to the bigquery.user role creates a dataset, that user is given OWNER access to the dataset. OWNER access to a dataset gives the user full control over it and all the tables and views in it. On the Details page, to the right of Labels, click Edit. To remove a label from a table or view, issue the bq update command with the clear_label flag. Repeat the flag to remove multiple labels. To remove the department:shipping label from mydataset.mytable, enter the bq update command with the --clear_label flag. 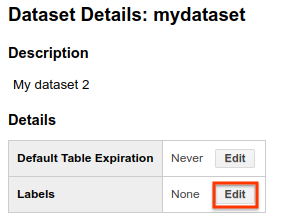 mydataset is in your default project. To remove the department:shipping label from mydataset.myview in myotherproject, enter the bq update command with the --clear_label flag. To remove a particular label for an existing table or view, call the tables.patch method and update the labels property for the table resource by setting the label's key value to null. To remove all labels from a table or view, call the tables.patch method and remove the labels property. Because views are treated like table resources, you use the tables.patch method to modify both views and tables. Also, because the tables.update method replaces the entire dataset resource, the tables.patch method is preferred. Currently, deleting a label from an existing job is not supported. A label that has a key with an empty value is used as a tag. You can create a new label with no value, or you can turn an existing label into a tag. Tags can be useful in situations where you are labeling a resource, but you do not need the key:value format. For example, if you have a table that contains test data that is used by multiple groups (support, development, and so on), you can add a test_data tag to the table to identify it. In the web UI, select the appropriate resource (a dataset, table, or view). For datasets, the dataset details page is automatically opened. For tables and views, click Details to open the details page. On the details page, click the pencil icon to the right of Labels. Delete the value for an existing label. To convert a label to a tag, use the bq update command with the set_label flag. Specify the key, followed by a colon, but leave the value unspecified. This updates an existing label to a tag. [KEY] is the label key that you want update to a tag. [RESOURCE_ID] is a valid dataset, table, or view name. If the resource is in a project other than your default project, add the project ID in the following format: [PROJECT_ID]:[DATASET]. Enter the following command to change the existing test_data:development label on mydataset to a tag. mydataset is in myotherproject, not your default project. To turn an existing label into a tag, call the datasets.patch method or the tables.patch method and replace the label values with the empty string ("") in the dataset resource or the table resource. Learn how to Add and use labels in BigQuery. Read about Labeling or tagging resources in the Compute Engine documentation. Read about Using labels in the Resource Manager documentation.